In this article, we will discuss how to integrate “Play with MySQL“. In this article, I am using Play 2.4.2 and MySQL 5.5.11. Follow the below steps to set up Play with MySQL. Step1: As a first step create a database in MySQL by following the below SQL commands(Expecting you have installed MySQL in your machine already). Step 2: Create a table to store information. Here we want to store student information. So creating a “Student” table. Step 3: As we are using MySQL as the database, we need to add MySQL Java Connector as the library dependency to the project. The library dependencies will be added to “build.sbt” available under root project folder. Step 4: Its time to mention the MySQL data source connection details in the “application.conf” available under <root_project_folder> –> conf. There are other JDBC settings available. You can explore the same here. Step 4: Now we will try to get the database connection. Step 5: Its time to write the controller code and the DAO code to save the student information. Below is the sequence diagram to depict the interaction of the components. 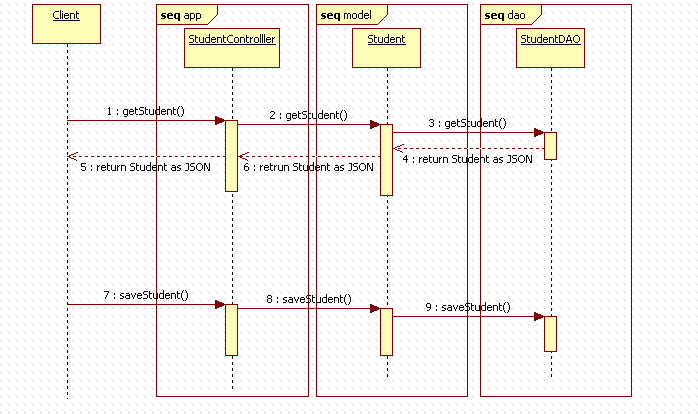 StudentController’s saveStudent method implementation is given below. StudentDAO’s saveStudent method implementation is given below. The source code created as part of this article is available on GitHub.